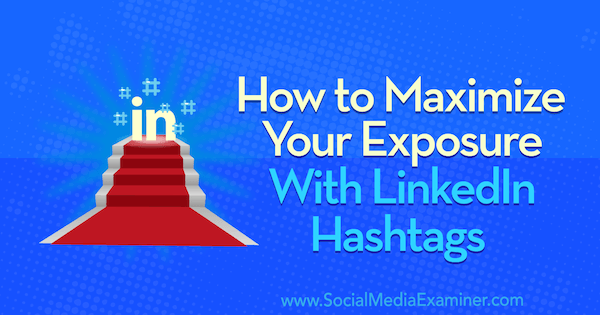 How to Maximize Your Exposure With LinkedIn Hashtags by Danielle McFadden on Social Media Examiner. 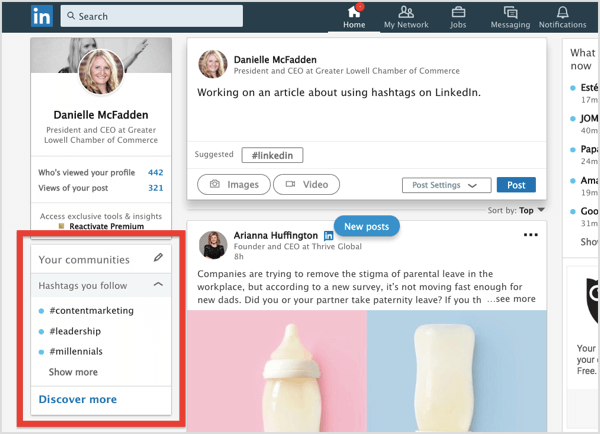 LinkedIn is encouraging users to post and search for specific hashtags using the Your Communities section on the left-hand side of their LinkedIn feed. If you see the Your Communities box on your home page, you have the ability to manage hashtag use and conversations more easily, right from a convenient location. Click the pencil icon to start adding hashtags to your list. Click on any hashtags you’re following to monitor and easily join the conversations built around them. Click Show More to see the full list of Linkedin hashtags you’re following. 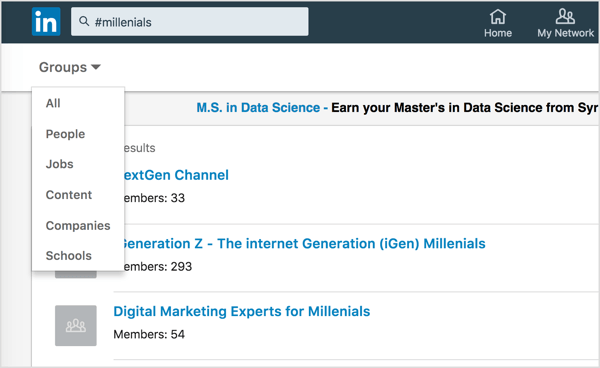 To customize the abbreviated list to show the top three LinkedIn hashtags you want to use, click the Pin icon next to the hashtags you want to show. If you pin the hashtags that are most relevant, it will save you the extra step of clicking Show More. 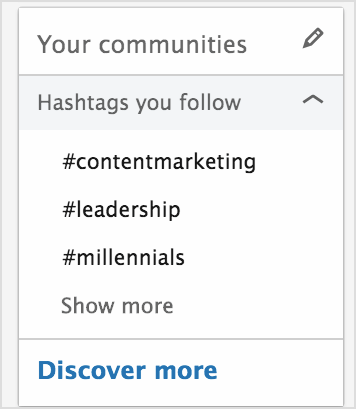 Seeing the pinned hashtags every time you visit LinkedIn will also reinforce using those hashtags when you post updates. Finally, you can click Discover More to find new hashtag suggestions. This is a great way to see the number of followers for specific hashtags, which can be a good indicator whether you should be using those hashtags too. Find a hashtag you like and click the + symbol to begin following it. Before you begin adding hashtags to your LinkedIn posts and articles, you’ll need to find hashtags that align with your LinkedIn marketing and the interests of your ideal audience. Do some additional research. Before adding any hashtag to your own strategy, it’s important to verify the hashtag’s popularity and contextual meaning. In the search bar, search for that hashtag and filter your search according to people, groups, and companies using that hashtag. This will help you discover if you should use a specific hashtag to reach a niche audience segment. 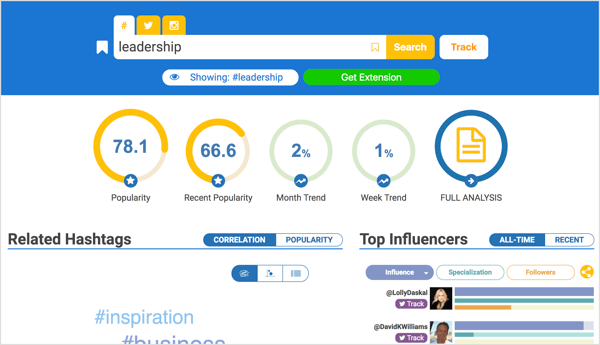 Try Hashtagify.me to vet hashtag popularity (and reveal the influencers who are using them). There’s a free option, as well as plans that start at $29 per month, billed monthly. You can evaluate plan options with a 7-day free trial. To discover what specific hashtags mean to an audience, try Tagdef. This site allows you to easily search for hashtags or phrases to discover their definition and popularity. A quick search can ensure that your hashtag doesn’t have a hidden message you didn’t know about. Pro Tip: To develop a hashtag strategy, you must first find the hashtags that best connect you with your ideal audience. 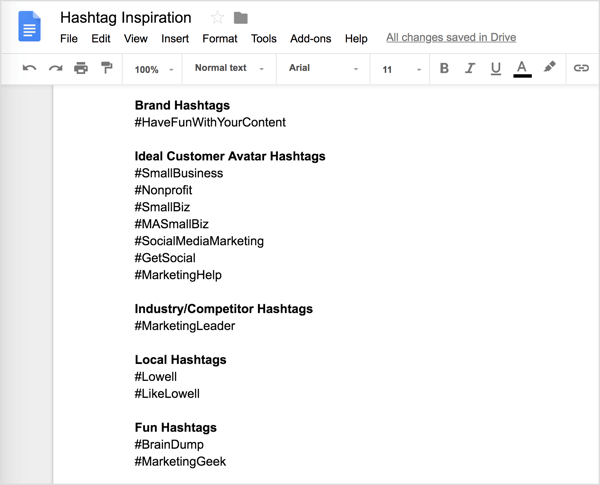 As you discover relevant hashtags, keep a running list of them in a Google Doc so you can quickly update your Linkedin Hashtags You Follow list as needed. 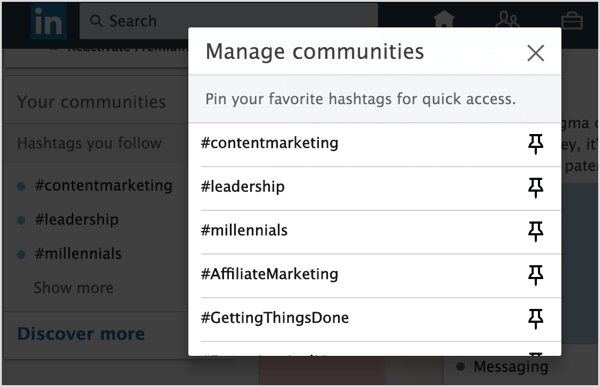 Now that you have your LinkedIn hashtags, you can begin using them. Here are a few tips to get you started. After you find relevant conversions with a hashtag search (or by clicking on the hashtag in the Hashtags You Follow box), comment on and like posts and articles written by other users to grow your network and get your name out there. It also helps strengthen and build your network on LinkedIn. Do you have any mutual connections? Do they work at a company you’ve been trying to connect with? Have they published a lot of articles? Follow and connect with them on LinkedIn and any other sites they’re on. By using hashtags in your post, you’re ensuring that your content will be discovered organically and by those following and searching for the hashtags you’re using. LinkedIn encourages this by generating recommendations. You can either use one of the hashtag suggestions or type in your preferred hashtags. This tactic can also help you deliver topical news and articles that relate to specific segments within your audience. Pro Tip: LinkedIn doesn’t limit the number of hashtags you can add to your articles, but they encourage users to use hashtags that are relevant. And while you can edit an article after it’s published, you can’t edit or remove hashtags. Remember to insert any hashtags before you publish your post! Once you find and join relevant LinkedIn groups, ask questions and share original content, interesting articles, and videos. Comment when other members post and share your experiences and insight. 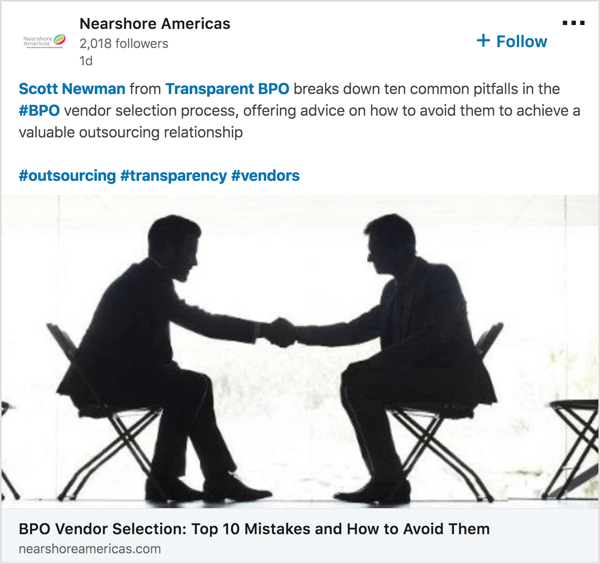 If a particular hashtag resonates with a LinkedIn member, it’s likely they’ll be interested in the same type of content on other social channels. Extending your use of hashtags to the rest of your social presences will make it easy for those followers to find your content, and by extension, find and follow you. Hashtags can be used to keep up with current events, follow industry trends, encourage conversations, and grow your influence. When used properly and consistently, hashtags are an effective tool for targeting a specific audience and growing your brand. Each social media platform is unique and you should adapt your hashtag strategy from site to site to reflect this. Click here to learn more about using LinkedIn for business. What do you think? Do you have access to the LinkedIn Hashtags You Follow feature? 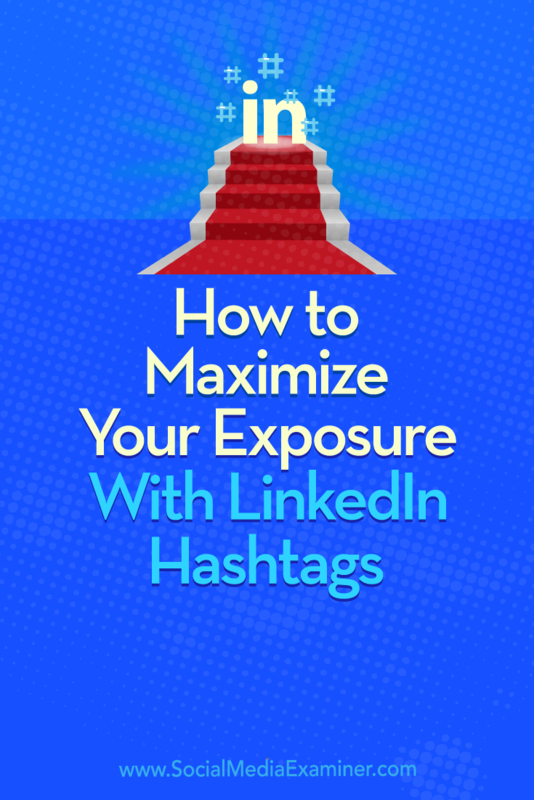 How are you using hashtags on LinkedIn? Share your thoughts in the comments below.